Cablivi FDA approval : Belgian biopharma company Ablynx has bagged approval from the US Food and Drug Administration (FDA) for its anti-vWF nanobody Cablivi (caplacizumab-yhdp) injection in combination with plasma exchange and immunosuppressive therapy for the treatment of acquired thrombotic thrombocytopenic purpura (aTTP). According to the FDA, aTTP is a rare blood clotting disorder in which patients develop extensive blood clots in the small blood vessels throughout the body. The clots can block supply of oxygen and blood to the major organs and result in strokes and heart attacks that may cause brain damage or death. Patients can get aTTP due to conditions like cancer, HIV, pregnancy, lupus or infections, or after undergoing surgery, chemotherapy or bone marrow transplantation. Cablivi targets von Willebrand factor (vWF), a protein found in the blood, which is involved in hemostasis. It is designed to prevent the interaction between vWF and platelets. Ablynx wins Cablivi FDA approval for aTTP. Photo courtesy of Ablynx. Commenting on Cablivi FDA approval, Richard Pazdur – acting director of the Office of Hematology and Oncology Products in the FDA’s Center for Drug Evaluation and Research, said: “Patients with aTTP endure hours of treatment with daily plasma exchange, which requires being attached to a machine that takes blood out of the body and mixes it with donated plasma and then returns it to the body. Even after days or weeks of this treatment, as well as taking drugs that suppress the immune system, many patients will have a recurrence of aTTP. Cablivi FDA approval was driven by a trial in which the Ablynx drug was assessed for its efficacy in comparison to placebo in 145 patients. The enrolled patients in both arms were subjected to the present standard of care of plasma exchange and immunosuppressive therapy. The results of the clinical trial showed that there was an improvement in platelet counts at a faster rate among patients, compared to placebo. Treatment with Cablivi also resulted in a lesser number of patients with either aTTP-related death and recurrence of aTTP through the treatment period, or at least one treatment-emergent major thrombotic event. The proportion of patients with aTTP recurrence in the overall study period was lower in the Cablivi arm at 13% compared to the placebo group at 38%. 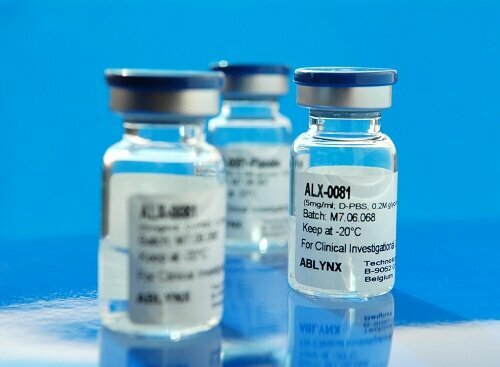 Prior to the Cablivi FDA approval, Ablynx was given Priority Review designation and also Orphan Drug designation. Ablynx was last year acquired by Sanofi in a €3.9 billion deal. Olivier Brandicourt – CEO of Sanofi, commenting on Cablivi FDA approval, said: “The U.S. approval of Cablivi provides a much-needed treatment option for people facing this challenging disease. There have been limited medicines available to treat aTTP until now.